The term 'Lower Darling' commonly refers to that portion of the Darling River regulated by releases from the Menindee Lakes Scheme. Inflows to the Menindee Lakes come from the Barwon-Darling River and its tributaries. The Lower Darling River is in the semi-arid environment of south-western NSW between Menindee and Wentworth. The Lower Darling catchment area is around 35,000 square kilometres. The general topography of the catchment is flat with elevations across most of the floodplain being less than 100 metres. 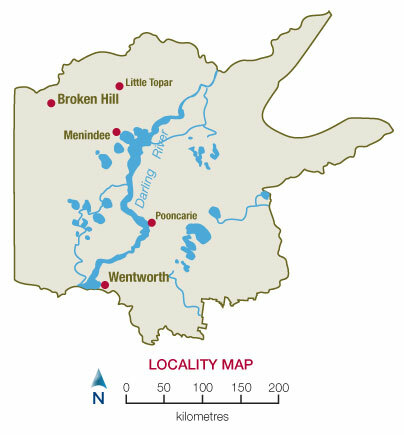 The township of Menindee is in the north of the catchment, adjacent to the Menindee Lakes. Midway along the Lower Darling River is the small village of Pooncarie. Wentworth is the largest town, located at the junction of the Murray and Darling Rivers. The Darling River flows for 530 kilometres from the Menindee Lakes to its junction with the Murray River. 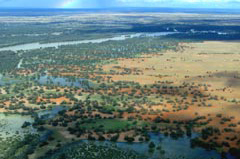 The Menindee Lakes are a major feature of the catchment. The seven, large, natural, Menindee Lakes have been modified for use as water storages, but also have significant environmental and recreational values. The Great Darling Anabranch is an ancestral channel of the Darling River. It has a natural offtake from the Darling River, but can also receive flows released directly from Lake Cawndilla, one of the Menindee Lakes. A number of large overflow lakes connected to the Anabranch provide important waterbird habitat. View real-time data from the Lower Darling catchment. The Menindee Lakes Scheme was completed in 1960 and stores 1,730,000 megalitres in its four main lakes – Menindee, Cawndilla, Pamamaroo and Wetherell. Water from the lakes is used to supply Broken Hill, replenish the Lower Darling environment, and supplement water supplies to users in NSW, Victoria and South Australia. Water is mainly used for irrigation. The major crops in the basin include grapes. The second largest use is for town water supply, which is mostly diverted to Broken Hill. Water is also used for livestock grazing and irrigated agriculture. Water is supplied on an annual basis through a new pipeline for stock and domestic use along the Great Darling Anabranch. The pipeline has achieved significant water savings for the environment. Water from the Menindee Lakes is shared between NSW, Victoria and South Australia as part of the Murray-Darling Basin Agreement, administered by the Murray-Darling Basin Authority. Sharing water resources fairly between the states, particularly during drought, to supply consumptive and environmental needs, is a key water management issue. The Lower Darling was subject to severe drought between 2001 and 2010. During this period, river flows reached record lows, with extraordinary water sharing arrangements implemented to secure water supplies for towns and critical water-dependent industries. Securing water for critical human needs while trying to protect and maintain riverine health is a key challenge. The Murray Darling Basin Authority is developing the Basin Plan to set new rules to govern water sharing in the Murray-Darling Basin in the context of ongoing drought and climate change. The NSW Office of Water will ensure that the needs of NSW water users and the environment are taken into account. Large volumes of water are lost each year through evaporation from the Menindee Lakes system. The Darling River Water Savings project, funded by the NSW and Commonwealth Governments, seeks to address this issue through new water management strategies and infrastructure. Reducing evaporation would increase the amount of water available for Broken Hill, downstream users and the environment. Kinchega National Park near Menindee covers over 440 square kilometres, including 62 kilometres of river frontage. It is one of only two large conservation areas along the Darling River and protects substantial areas of river red gums, and rare acacia and bluebush communities. The park also has significant Aboriginal and European heritage values. The Menindee Lakes are important waterbird habitat with over 30 species of waterbirds recorded on the main lakes, including threatened species such as freckled duck and migratory waders. The lakes are listed in the Directory of Important Wetlands in Australia. The Darling Anabranch Lakes also provide extensive areas of waterbird habitat. Listed in the Directory of Important Wetlands in Australia, the lakes have a combined area of 43,000 hectares and hold water for up to five years. To preserve water resources in river and groundwater systems for the long term it is critical to balance the competing needs of the environment and water users. Water sharing plans establish rules for sharing water between the environmental needs of the river or aquifer, and water users, and also between different types of water use such as town supply, rural domestic supply, stock watering, industry and irrigation. Under the Water Management Act 2000 all water sharing plans are required to have performance indicators to assess whether the plans have been effective in meeting their objectives. The Environmental flow response and socio-economic monitoring. Murray Valley and Lower Darling River - progress report 2011 ((PDF 6.8 MB)) summarises activities undertaken in the previous water year and provides an interim assessment of outcomes from the investigations. The department has released General Purpose Water Accounting Reports for the Lower Darling catchment providing annual consolidated and informative summaries of water resources availability and water management issues. These reports have been produced using the Australian Water Accounting Standard. The water resources and management overview for the Lower Darling catchment provides information on climate, land use, the environment, water resources, and river operations and management. Information on the management of high flows into Menindee Lakes during 2010-11 can be found in a series of community information updates available at droughts and floods.